This beautifully designed Dresser and Mirror Combo bring together everything to love about contemporary, rustic and industrial styling. Both pieces boast a sleek case design and wood finish that pairs beautifully with the bin handle hardware and black metal accents. 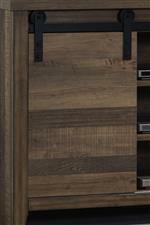 Furthermore, the sliding barn door adds a touch of updated rustic style. Finally, use the spacious drawers to store all of your clothing and accessories. 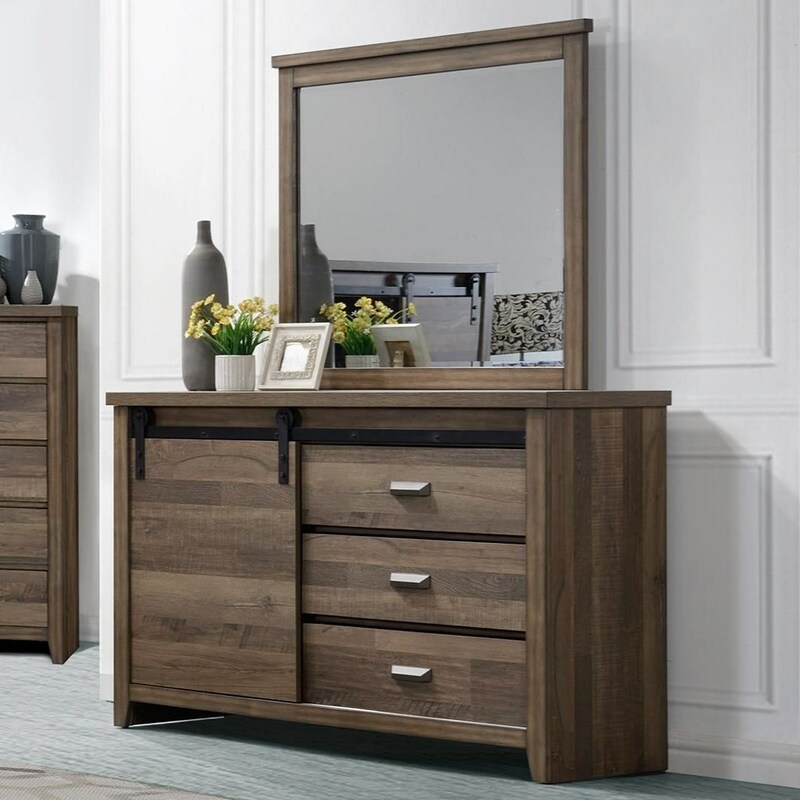 The Calhoun Rustic-Industrial Sliding Barn Door Dresser and Mirror Combo by Rooms Collection One at Rooms Furniture in the Houston, Sugar Land, Katy, Missouri City, Texas area. Product availability may vary. Contact us for the most current availability on this product. Give your bedroom an updated take on rustic design with this collection of gorgeous bedroom furniture. The trending sliding barn door is on full display and brought down to a smaller scale, being featured on the media chest, dresser and headboard of the bed. This along with a sleek wood grain finish give this collection an aesthetic all its own. The Calhoun collection is a great option if you are looking for Rustic Industrial Contemporary furniture in the Houston, Sugar Land, Katy, Missouri City, Texas area. Browse other items in the Calhoun collection from Rooms Furniture in the Houston, Sugar Land, Katy, Missouri City, Texas area.